His orthodox opinions are clearly shown in his writing. His major concern was divisions in the Anglican church. In the 1730s he published a number of pamphlets, including A Letter to the Authors of Divine Analogy and the Minute Philosopher (1733) calling on Berkeley and Peter Browne to abandon their theological differences in the interest of church unity against deism, A Vindication of the Right Rec. the Bishop of Winchester (1736), which satirically attacked Benjamin Hoadly’s work on Communion and Some Proposals for the Revival of Christianity(1736). During this time he was curate in of Drummilly County Fermanagh (1729-1732), Monaghan (1732-1750) and had a brief interlude in 1742-3 as tutor to James Caulfeild, later 1st Earl of Charlemont4. His major work was Ophiomaches, or Deism Revealed (1749, subsequent editions were published as Deism Revealed). The aim of this book is to “bring real Deism and real Christianity, into the field, to confront each other”5 removing the confusion involved when deists like Toland presented themselves as Christians and Christians such as Locke and Clarke used deistic arguments. Skelton opposes the view that a person can know the truth and live a good life without the help of (religious) revelation. The book takes the form of eight dialogues. The fifth dialogue contains the earliest criticism of Hume’s essay “On Miracles”, with Skelton’s mouthpiece “Shephard” asserting that experience cannot rule out such miracles as Jesus’ resurrection and that God’s compassion for humanity would lead to sending a miracle-worker as emissary. Skelton’s biographer reports that Skelton only saw Hume’s Essays when shown them by Dr Connebear in Oxford, while travelling to London in 1748 to get the book printed, and added replies at Connebear’s request. 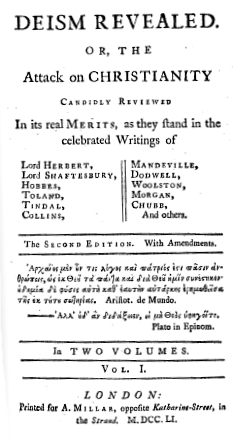 The eighth dialogue contains a history of deism from Lord Herbert of Cherbury to the 1740s, and was extended in later editions6. David Berman says that the book appears to have been widely read in the eighteenth and nineteenth centuries, though forgotten now. It was not universally praised: one reviewer objected to Skelton’s apparent assumption that the smallest deviation from orthodoxy was enough to make you an deist7. Coleridge reading 75 years later noted in the margins of the book, “so great a man” but also “a Bit of a Bully” 8. Skelton’s bishop Robert Clayton was not particularly enthusiastic either. He reportedly told the Bishop of London offhandedly that the writer was a curate in his diocese when the book was discussed. Given that Clayton was an Arian, that is probably not surprising. Skelton’s work probably provoked Clayton’s notorious Letter on Spirit against the doctrine of the Trinity. One must also wonder if it explains why, when (then Dean of Down) Patrick Delany insisted Skelton get a living, Skelton was sent to Pettigo9. Hume was not the only Scottish Enlightenment philosopher that Skelton argued against. During a visit to a Northern bishop, Skelton managed to annoy the Bishop’s wife, who apparently was all but the bishop herself. She was a fan of Francis Hutcheson and arranged to have a book by a disciple of Hutcheson placed in Skelton’s room. The next morning she sent a deacon to discuss the book with Skelton, but Skelton described the book as full of nonsense, raising her ire10. Norman Moore in the preface to the reprinted “Life” suggests that Skelton knew the Catholic bishop and prior on Lough Derg (a site of pilgrimage) and may have read John Colgan’s Trias Thaumaturga on Patrick. (Certainly, if Skelton was seeking scholarly company, the Franciscans in Lough Derg would among the closest.) The biography itself reports that Skelton always “had a regard for those of the Catholic persuasion” due to the preservation of his family farm by neighbouring Catholics, citing him as saying that “the poor original Irish were naturally faithful, humane and adverse to blood” (Life, p. 12). Moore tells us that Skelton was still remembered in Pettigo in 1880. (Today Skelton is featured on the Pettigo.org website). Skelton moved from Pettigo after the death of Clayton. He first had the living in Devenish, County Fermanagh (allowing him to live in Enniskillen) from 1759 to 1766, moving to Fintona (or Donacavey) County Tyrone until 1780. His biography describes many charitable works he performed, especially in terms of famine relief, including twice selling his library to raise relief funds. He continued to write, with his admiration for honesty in religion shown in his tract Observations on a late Resignation. In the tract he argues against William Robertson’s An Attempt to explain the Words, Reason, Substance, which suggests the church should abandon all disputed theological points but Skelton goes on to praise Robertson’s resignation from the Established Church on grounds of principle. Skelton later offered Robertson financial support, an offer which Robertson refused but that triggered an long-term correspondence between them. Despite his work and prolific publications, he is largely forgotten today. Even his grave is lost. He retired to Dublin in 1780, dying on 4th May 1787, and was buried near the west door of St. Peter’s Church – St. Peters Church being demolished in the 1980s.